The Haiti toilet project was a project to build a new toilet system for the school attached to Notre Dame Cathedral in Port-au-Prince. Conceived in late 2012, it was completed in February, 2014. We have pictures taken by the St. George’s Haiti Team which visited Port-au-Prince in April. The pictures are the most comprehensive look at the facility. The toilets were a needed replacement for the existing system- two latrines and shower stall system, clearly inadequate for 300 students. The new toilet is 24 square meters (28.6 square feet) and has 6 stalls, three for the girls and one stall plus a trough urinal for the boys. This will support 300 students. The priest of Notre Dame Cathedral Frantz Cole said “All our teachers are grateful to see that the kids will be back quicker to their classrooms because the line to wait at the time we had one toilet is past." The cost of the project was $21,420. Fundraising began with a presentation at the Region One meeting in the February, 2013 by Joe Junod of Christ Episcopal who was working closely with Carey Chirico at St. George's on it. Region One and churches raised $21,614 from April, 2013 to when construction began in the fall. Region One kicked in $2,000. The Diocese of Virginia contributed $1,000. The 19 Region Churches had a chance during that time to raise money in their congregations. Several individuals within the churches separately made sizeable contributions. The construction was expected to take 2 months but took almost 5 months. Why ? 1. The material delivery was a problem to complete certain components. 2. There were management issues within the construction company. 3. The location of the project proved to be quite difficult in terms of hiring labor. Many who were hired were unskilled but were required to be hired otherwise; the ones with skill were hindered from entering the area. 4. Size of the building area. The building area was small. Upon investigation of the structure of the boundary walls, it was determined that excavation for a septic system below the new building was not feasible without undermining the existing boundary walls. The solution was to repair an in‐ground cistern well and modify it to serve as a soakage pit for the new building. Meanwhile, a new modern septic tank was buried between the new toilet building and the existing in‐ground cistern. The plumbing runs from the new building, to the new tank, to the former tank/new soakage pit. MSAADA from Minneapolis, an architectural and management, assisted in both areas - creating the drawings for the contractor and supervising the construction process. This was very beneficial to have an experienced company used to work within the Haitian system. They provided a comfort level that the project would be properly constructed. The project was another step in the developing relationship between the Diocese of Va. and Haiti and particularly the Notre Dame Church. The relationship first started after the 2010 earthquake. The 7.0 Earthquake in Haiti killed 310,000 and left 1 million homeless. Disease was rampant. This was to the poorest nation in this hemisphere before the earthquake. In 2011 a relationship was established between St. George’s and Notre Dame Cathedral in Port-au-Prince Haiti. Other churches in our Region, Trinity Episcopal, Christ Episcopal and Church of the Incarnation have contributed their donations and time and money toward developing this partnership. In particularly their funds have provided scholarship for students for books and support for teachers. Currently, St. George's has organized twice yearly medical missions to that country. 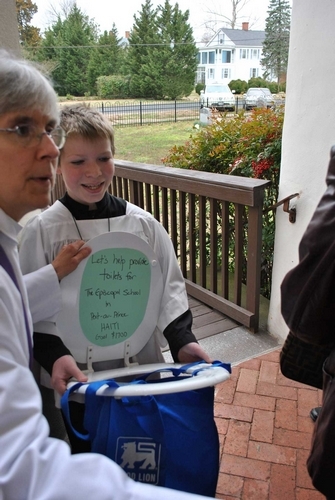 The toilets project is keeping with Diocese of Virginia's 5 Priorities for mission and ministry, especially for multiculturalism and proclamation and mission beyond ourselves. A slide show follows of the Haiti toilets project starting with the drawings and concept, moving on to construction in the fall of 2013 and then the completed facility. 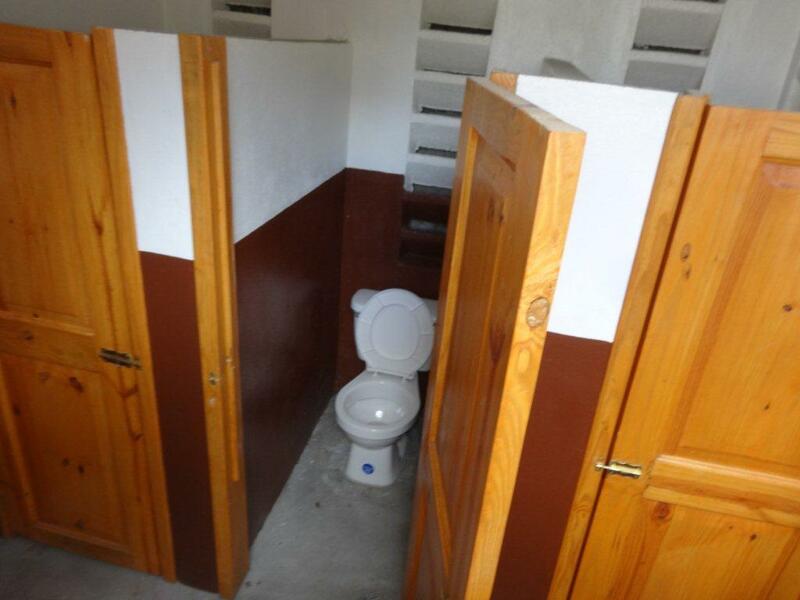 The pictures of the completed facility were taken by the St. George's Haiti team in April, 2014.